Showing 1 - 1 of 1 Products for Automatic Transmission Dipstick. No filter tube needed. The locking mechanism eliminates expulsion of the dipstick handle under trans pressure. Bolted in sealed pan fitting. Large filter tube accepts standard transmission funnels. 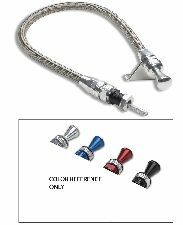 Made from 6061 aluminum and features Teflon lined stainless braided outer housing. Flexible inner dipstick measuring cable. No pan fitting leaks during storage. Dipsticks are available with firewall mount or transmount mounting bracket. The transmission and firewall mounts are supplied with transmission storage plug for quick change and storage. Spare transmission fittings are available for quick transmission changes. Available for most GM, Ford and Chrysler transmissions. Available in brite, black, blue and red anodized.